4 Bedroom Family Holiday Cottage, Sleeps 10, with Heated Pool & Amazing Views. Bluebell Cottage is a large 4 Bedroom rural holiday cottage, that has been recently modernised & renovated to provide a lovely well equipped property, but whilst maintaining many of the properties original features. The property can comfortably sleep up to 10 people plus under 2 years old in cots. and is fully equipped with everything needed for a relaxing, enjoyable and comfortable family holiday. The cottage has 4 bedrooms, 2 Double a Twin and a Twin/Family Room (with a double sofabed). We can also provide 2 cots and a high chair. The cottage has 2 full family bathrooms. The cottage has direct access onto the patio/terrace with Table, Chairs, Parasols & a BBQ, from the Patio / Terrace it leads on to the large secure garden, where you will find the heated outdoor pool. The property has outstanding views of the countryside from all angles. This property is perfect for a large family or a group of friends wishing to holiday together. Bath Towels are provided and included in the rental. We ask that you bring beach towels for use at the pool or if you visit the beach. Beach Towels can be hired from us to save luggage space. Local free calls, all other calls are chargeable. Electric Heaters in every bedroom. There is a washing machine within the kitchen, and an airer for drying. An airer iss provided, or use of the Tumble Dryer fora supplement. Wi-fi internet is available throughout the property. We provide all bath, hand & tea towels. Please bring towels for using at the pool or taking to the beach. We do hire beach towels please ask. A large open plan lounge, with 2 Large sofas, TV(UK & FR channels) DVD Player, and Original Fireplace with Log Burner. Our welcome pack includes Tea, Coffee, Sugar, Milk, Water, Salt & Pepper, plus cleaning cloths. This is provided on stays of 4 nights or more. The main dining table can seat 8 people, there is another small dining table in the lounge that can be moved into the dining room to seat full occupancy. We have a selection of books. We have a selection of indoor & outdoor toys. Large safe & secure garden, with Childrens Playarea (Swings, Slide, See-Saw, Climbing Rope), plus football & badminton net. Available to hire a local charge. The terrace is directly behind the property and can be accessed from the lounge or the kitchen. There is seating for 10 around a large table with parasols. At Saint_Dizier Leyrenne (5km away). 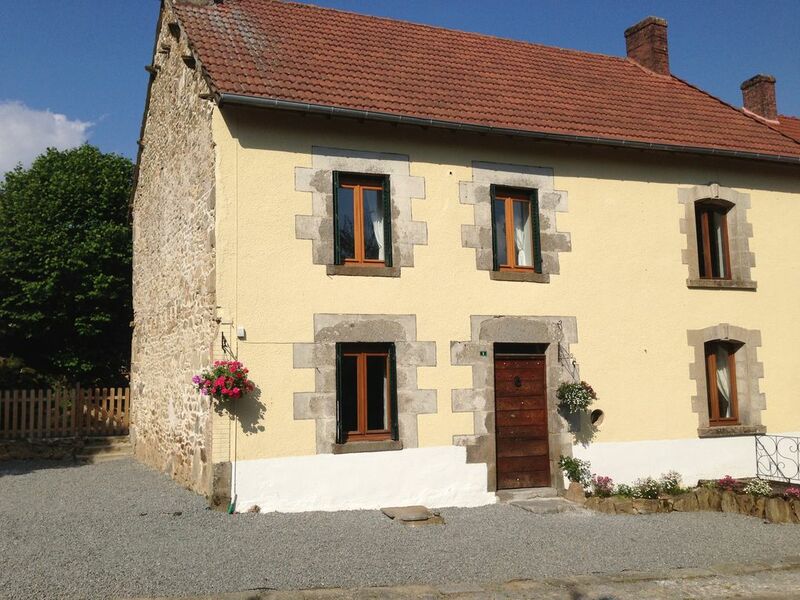 Private to the complex, but shared between the 2 gîtes. Heated in-ground pool, fully compliant with French pool security. Open from May to Oct (weather depending) & cleaned daily. This property is one of two gîtes within our gîte complex. The gîte itself is fully self-contained and private, with it;s own entrance. The only shared facilities are the garden and the pool. These facilities are listed as shared/private as they are only to be used by guests of Meadow View Gîtes. Changeover is on a Saturday during peak season, during the rest of the year there is more flexibility. We ask our guests to arrive after 16.00 and depart 10.00, additional charge may apply for late departures. A complimentary welcome pack is provided on arrival (for stays of 4 nights or more) and is full of basic essentials for your first few days. We also provide a guest handbook full of local information about the supermarkets, cafes, bars & restaurants, all the wonderful places to visit. Other grocery items can be purchased for your arrival, this can prove extremely useful when arriving in rural France, please ask for further details. We are always available for help, advice or any info. Superbe séjour pour Noël, merci de votre accueil, gîte agréable, propriétaires adorable. Nous reviendrons avec plaisir eu esperant pouvoir profiter de la piscine!! Gîte agréable et bien equipe, nous avons apprécié la gentillesse des propriétaires. Thank you do much for you lovely review, we are so pleased you all enjoyed your stay and we hope to see you again in the future. From the moment we arrived we just loved it! We had a week’s stay in Bluebell Cottage and from the moment we arrived we loved it, the accommodation is perfect. Rooms are all beautifully decorated and a really great size, all the beds all very comfortable. Most of all everything is provided & the whole house was spotlessly clean. The facilities throughout are fantastic, every detail has been thought of, in fact there was nothing else we could have wished for. Another special mention must be made of the pool, it is “Absolutely fantastic”, the host Bryan admits he has OCD with the pool, and he looks after it meticulously and whole terrace is spotlessly clean. We had several days just lazing around admiring the stunning views from the terrace whilst the little kids had hours and hours of fun in the pool. Lac de Vassiviere - for Watersports, Beaches & Cafes, a wonderful day out for all the family. Ladyrinthe Geant - Largest permanent maze.